Clinically Proven: Visibly Healthier Hair With Every Wash* (*shampoo+conditioner vs non-conditioning shampoo). 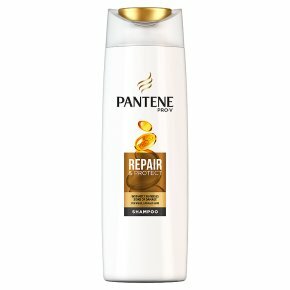 Pantene Pro-V Repair & Protect shampoo instantly fights signs of damage and nourishes damaged or dry hair. For healthy-looking shine and smooth hair. Restore hair?s strength against styling damage. Prevent the formation of split ends. Instantly reverses signs of damage. For weak, damaged hair. Pantene Pro-V Repair & Protect shampoo gently cleanses, while giving hair active Pro-V Nutrients. Instantly reverses signs of damage such as breakage, lack of smoothness & shine.